He was, in 1750, with full reputation, chosen fellow of Bene’t-college; was, in 1753, ordained at Kew chapel, by Dr. Thomas, bishop of Peterborough, and appointed, by the recommendation of archbishop Herring, to the curacy of Sundridge in Kent; after which he became assistant preacher at St. Anne’s, Soho, where his father resided, and Dr. Squire, afterwards bishop of St. David’s, was rector, | with whom he lived in particular intimacy, and who gave him a chaplainship, and intended to patronize him; but in that instance, and several others, he experienced the loss of friends and patrons before they had been able to gratify their own intention, or bestow on him any thing considerable. His elegant discourses acquired him, as a preacher, great reputation; his language was always correct, his expression forcible, and his doctrine so pathetically delivered, as to impress his hearers with reverence and awaken their attention. His voice was harmonious; and rather by the distinct articulation, than from strength, he was better heard, in many large churches, and particularly in the choir of Canterbury cathedral, than some louder tones, having cultivated the art of speaking in the pulpit; and his sermons always recommended that moderation, truly Christian temper, and universal charity and philanthropy, which formed the distinguished mark of his character in every part of life; and he was totally free from all affectation, as well in the pulpit as in common conversation. He was a popular and admired preacher; but he had no vanity on that account, and was equally satisfied to fulfil his duty in a country parish, and an obscure village, as in a crowded cathedral, or populous church in the metropolis. But his merit was not much regarded by the attention of the great. 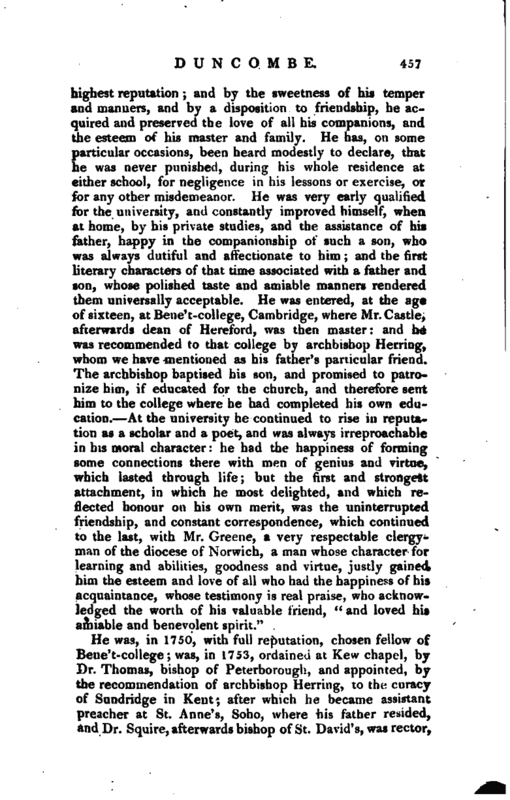 He was, however, esteemed, honoured, and beloved, in the very respectable neighbourhood where he constantly resided; and the dignities and affluence he might reasonably have expected from his family connections, and early patronage, could only have displayed, in a wider sphere, that benevolence, and those viriues, which are equally beneficial to the possessor, in whatever station he may be placed, when exercised to the utmost of his ability. 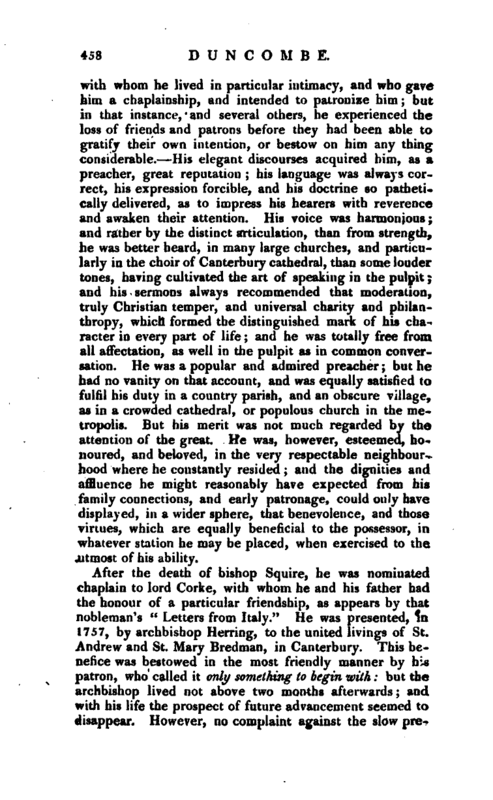 After the death of bishop Squire, he was nominated chaplain to lord Corke, with whom he and his father had the honour of a particular friendship, as appears by that nobleman’s “Letters from Italy.” He was presented, in 1757, by archbishop Herring, to the united livings of St. Andrew and St. Mary Bredman, in Canterbury. This benefice was bestowed in the most friendly manner by his patron, who called it only something to begin with: but the archbishop lived not above two months afterwards; and with his life the prospect of future advancement seemed to disappear. However, no complaint against the slow | preferment from his respected friend and patron, no murmur against the daily dispositions of benefices, to which he must be conscious his merit often gave him equal claim, ever was suffered to escape in conversation. This living enabled him to fulfil a long engagement, or rather to obey the impulse of a long attachment, to miss Highmore, daughter of Mr. Highmore, who was known to the world, not only by his pencil, but by his other extensive knowledge, and literary pursuits. 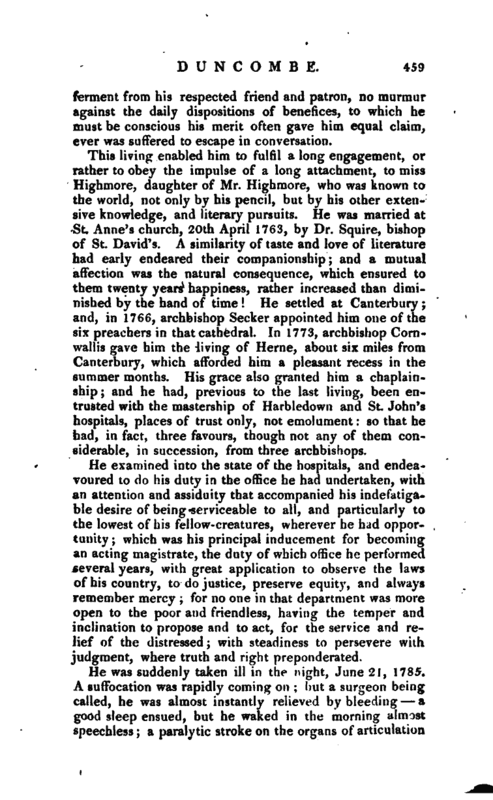 He was married at St. Anne’s church, 20th April 1763, by Dr. Squire, bishop of St. David’s. A similarity of taste and love of literature had early endeared their companionship; and a mutual affection was the natural consequence, which ensured to them twenty years happiness, rather increased than diminished by the hand of time! He settled at Canterbury; and, in 1766, archbishop Seeker appointed him one of the six preachers in that cathedral. In 1773, archbishop Cornwall is gave him the living of Herne, about six miles from Canterbury, which afforded him a pleasant recess in the summer months. His grace also granted him a chaplainship; and he had, previous to the last living, been entrusted with the mastership of Harbledown and St. John’s hospitals, places of trust only, not emolument: so that he had, in fact, three favours, though not any of them considerable, in succession, from three archbishops. 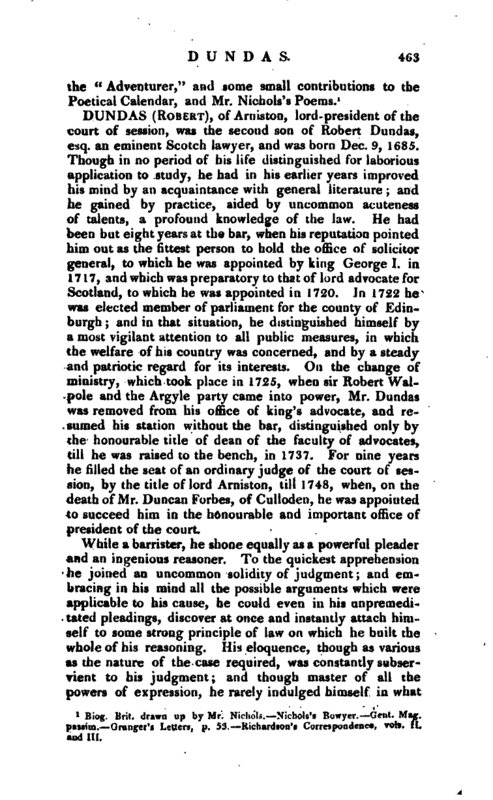 He examin.ed into the state of the hospitals, and endeavoured to do his duty in the office he had undertaken, with an attention and assiduity that accompanied his indefatigable desire of being serviceable to all, and particularly to the lowest of his fellow-creatures, wherever he had opportunity; which was his principal inducement for becoming an acting magistrate, the duty of which office he performed several years, with great application to observe the laws of his country, to do justice, preserve equity, and always remember mercy; for no one in that department was more open to the poor and friendless, having the temper and inclination to propose and to act, for the service and relief of the distressed; with steadiness to persevere with judgment, where truth and right preponderated. He was suddenly taken ill in the night, June 2!, 1785. 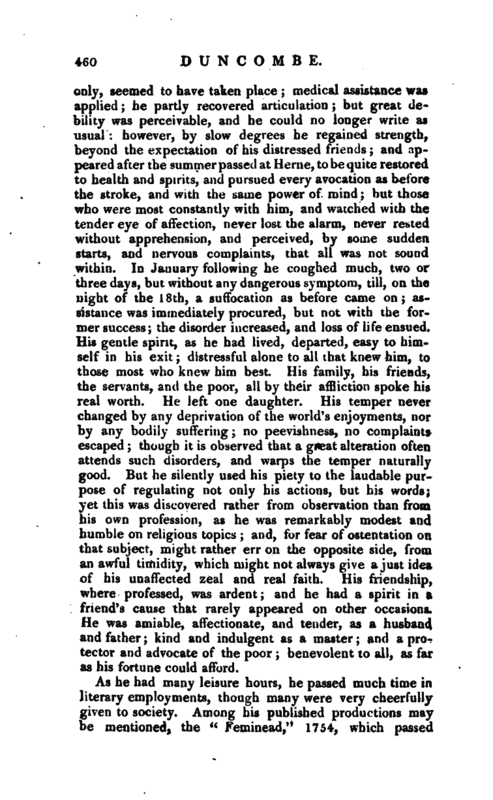 A suffocation was rapidly coming on; but a surgeon being called, he was almost instantly relieved by bleeding a good sleep ensued, but he waked in the morning almost speechless; a paralytic stroke on the organs of articulation | only, seemed to have taken place; medical assistance was applied; he partly recovered articulation; but great debility was perceivable, and he could no longer write as usual: however, by slow degrees he regained strength, beyond the expectation of iiis distressed friends; and appeared after the summer passed at Herne, to be quite restored to health and spirits, and pursued every avocation as before the stroke, and with the same power of mind; but those who were most constantly with him, and watched with the tender eye of affection, never lost the alarm, never rested without apprehension, and perceived, by some suaden starts, and nervous complaints, that all was not sound within. In January following he coughed much, two or three days, but without any dangerous symptom, till, on the night of the 18th, a suffocation as before came on; assistance was immediately procured, but not with the former success; the disorder increased, and loss of life ensued. His gentle spirit, as he had lived, departed, easy to himself in his exit; distressful alone to all that knew him, to those most who knew him best. His family, his friends, the servants, and the poor, all by their affliction spoke his real worth. He left one daughter. His temper never changed by any deprivation of the world’s enjoyments, nor by any bodily suffering; no peevishness, no complaints escaped; though it is observed that a great alteration often attends such disorders, and warps the temper naturally good. But he silently used his piety to the laudable purpose of regulating not only his actions, but his words; yet this was discovered rather from observation than from his own profession, as he was remarkably modest and humble on religious topics; and, for fear of ostentation on that subject, might rather err on the opposite side, from an awful timidity, which might not always give a just idea of his unaffected zeal and real faith. His friendship, where professed, was ardent; and he had a spirit in a friend’s cause that rarely appeared on other occasions. He was amiable, affectionate, and tender, as a husband and father; kind and indulgent as a master; and a protector and advocate of the poor; benevolent to all, as far as his fortune could afford. As he had many leisure hours, he passed much time in literary employments, though many were very cheeriully given to society. Among his published productions maybe mentioned, the “Feminead,” 1754, which passed | through two editions, and has been reprinted both in tlu Poetical Calendar, and in Pearch’s Collection. Four Odes appeared in 1753, viz. “The Prophecy of Neptune;” “On the Death of the Prince of Wales;” “*Ode presented to the Duke of Newcastle” and one “*To the hon. James Yorke,” first bishop of St. David’s, and afterwards bishop of Ely. Between 1753 and 1756 came out separatelv, “*An Evening Contemplation in a College,” being a parody on Gray’s Elegy“reprinted in” The Repository.“Other detached poems of Mr. Duncombe’s are,” *Verses to the Author of Clarissa,“published in that work;” *Verses on the Campaign, 1759,“(addressed to Sylvanus Urban, and originally printed in the volume for that year);” *To Colonel Clive, on his arrival in England;“” *On the Loss of the Ramilies, Captain Taylor, 1760;“” Surrey Triumphant, or the Kentish Men’s Defeat, 1773,“4to; a parody on Chevy ­Chace; which, for its genuine strokes of humour, elegant poetry, and happy imitation, acquired the author much applause. 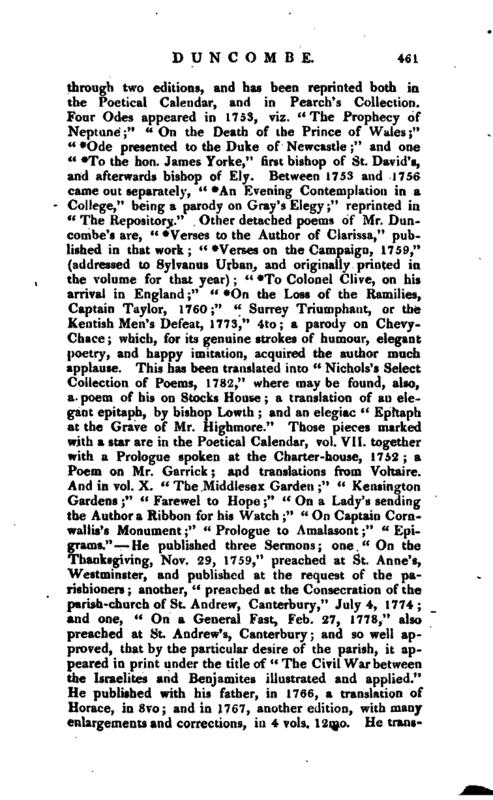 This has been translated into” Nichols’s Select Collection of Poems, 1782,“where may be found, also, a poem of his on Stocks House; a translation of an elegant epitaph, by bishop Lowth; and an elegiac *’ Epitaph at the Grave of Mr. Highmore.” Those pieces marked with a starare in the Poetical Calendar, vol. VII. together with a Prologue spoken at the Charter-house, 1752 a Poem on Mr. Garrick and translations from Voltaire. And in vol. X. “The Middlesex Garden” “Kensington Gardens” “Farevvel to Hope” “On a Lady’s sending the Author a Ribbon for his Watch” “On Captain Cornwallis’s Monument” “Prologue to Amalasont” “Epigrams.” He published three Sermons; one “On the Thanksgiving, Nov. 29, 1759,” preached at St. Anne’s, Westminster, and published at the request of the pa- 4 rishioners another, “preached at the Consecration of the parish-church of St. Andrew, Canterbury,” July 4, 1774; and one, “On a General Fast, Feb. 27, 1778,” also preached at St. Andrew’s, Canterbury; and so well approved, that by the particular desire of the parish, it appeared in print under the title of “The Civil War between the Israelites and Benjamites illustrated and applied.” He published with his father, in 1766, a translation of Horace, in 8vo; and in 1767, another edition, with many enlargements and corrections, in 4 vols. 12mo. He trans* | lated the “Huetiana,” in the Gentleman’s Magazine for 1771. In 1774, he translated Batteley’s “Antiquitates Rutupinte.” He wrote “The Historical Account of Dr. Dodd’s Life,” 1777*, 8vo; and was the translator of“Sherlock’s Letters of an English Traveller,” 1st edition, 4to. The 2d edition, 8vo, was translated by Mr. Sherlock himself. 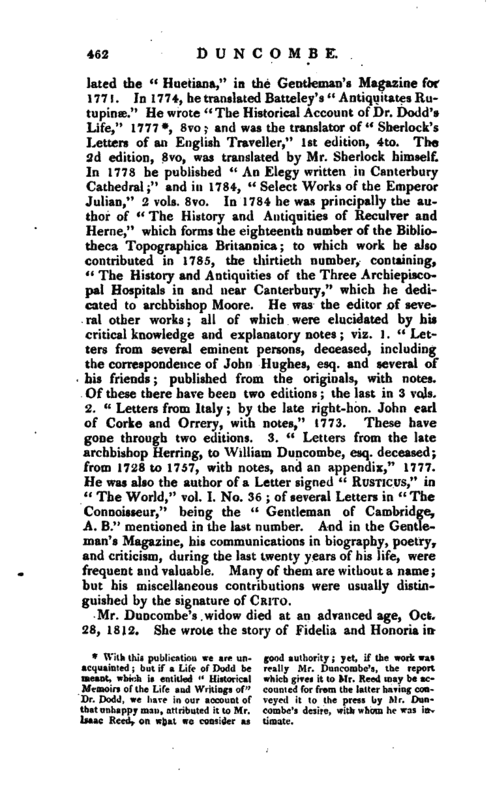 In 1778 he published *’ An Elegy written in Canterbury Cathedral;“and in 1784,” Select Works of the Emperor Julian,“2 vols. 8vo. 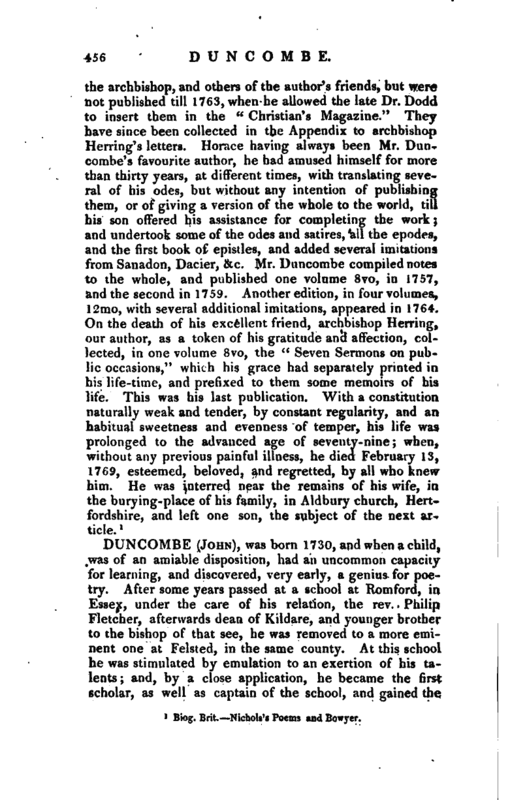 In 1784 he was principally the author of” The History and Antiquities of Keculver and Heme,“which forms the eighteenth number of the Bibliotheca Topographica Britannica to which work he also contributed in 1785, the thirtieth number, containing,” The History and Antiquities of the Three Archiepiscopal Hospitals in and near Canterbury,“which he dedicated to archbishop Moore. He was the editor of several other works; all of which were elucidated by his critical knowledge and explanatory notes; viz. 1.” Letters from several eminent persons, deceased, including the correspondence of John Hughes, esq. and several of his friends; published from the originals, with notes. Of these there have been two editions; the last in 3 vols. 2. “Letters from Italy; by the late right-hon. John earl of Corke and Orrery, with notes,” 1773. These have gone through two editions. 3. “Letters from the late archbishop Herring, to William Buncombe, esq. deceased; from 1728 to 1757, with notes, and an appendix,” 1777. He was also the author of a Letter signed “Rusncus,” in “The World,” vol. I. No. 36 of several Letters in “The Connoisseur,” being the “Gentleman of Cambridge, A. B.” mentioned in the last number. And in the Gentleman’s Magazine, his communications in biography, poetry, and criticism, during the last twenty years of his life, were frequent and valuable. Many of them are without a name; but his miscellaneous contributions were usually distinguished by the signature of Crito. Biog. Brit, drawn up by Mr. Nichols. Nichols’s Bowyer. —Gent. Mag. passim. -Granger’s Letters, p. 53. Richardson’s Correspondeiice, vols. II. and III.